The US Food and Drug Administration (FDA) is considering banning the sale of flavoured e-cigarettes, citing an “epidemic” of use among teens. The proposal, announced on Wednesday, is part of a broader effort to curb teen use of the nicotine devices. The toughened approach comes after firms ignored prior concerns, he added. “I’ve been warning the e-cigarette industry for more than a year that they needed to do much more to stem the youth trends,” he said. “In my view, they treated these issues like a public relations challenge rather than seriously considering their legal obligations, the public health mandate, and the existential threat to these products. Five of the biggest e-cigarette manufacturers – JUUL, Vuse, MarkTen, blu e-cigs, and Logic – must also report to the agency within 60 days with plans to address the concerns, or face penalties, it said. JUUL, which is already facing FDA investigation for its marketing practices, said it would “work proactively with FDA in response to its request”. “We are committed to preventing underage use of our product, and we want to be part of the solution in keeping e-cigarettes out of the hands of young people,” the company said in a statement. Last month, a parliamentary committee in the UK issued a report calling for rules regarding e-cigarettes to be relaxed. It cited estimates from Public Health England that e-cigarettes are 95% less harmful than normal cigarettes. Dr Gottlieb acknowledged that the toughened approach would force “hard trade-offs” when it comes to promoting e-cigarettes to adults. However, he added: “The youth risk is paramount”. In the US, about 12% of high school students use e-cigarettes at least once a month, the US Centers for Disease Control and Protection estimated in 2017. 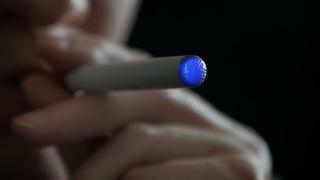 It has warned that most such products contain nicotine, which is addictive and can affect brain development. Dr Gottlieb said the agency plans to launch a national campaign to raise awareness of the risks to teens, as it sees signs that the number of users is increasing. It will also “re-visit” the policy it announced last year, which gave e-cigarette companies more time to apply for regulatory approval. “We must do more to stem what I see as an epidemic of use of e-cigs among teens, and deeply disturbing trends that show no sign of abating,” he said.